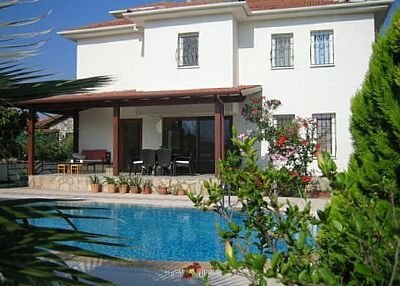 A delightful 3 bedroomed detached holiday villa on the outskirts of Dalyan. Finished and furnished to a very comfortable standard. The villa comprises of 1 large Double master bedroom with ensuite shower room,1 double bedroom and 1 twin bedroom sharing a large family bathroom. Situated on the outskirts of Dalyan the villa is very well furnished and designed for the perfect relaxing holiday. Whether you are a family, couples or friends sharing, the benefit of this property is that you can truly relax and get away from it all. You can have peace and tranquility if that is what you desire, but you are only a stones throw from Dalyan where you can take advantage of the many bars and restaurants by night time or take a boat to the beach or the lake in the day time for a change from the pool. There are numerous historic and cultural sights to visit and a plethora of activity based outings to enjoy. We believe Dalyan has something for everyone, whatever age or interest ! Villa Oleander has a very large walled garden which is well planted with fruit trees and shrubs and boasts a covered lounging area to while away the time with a good book or glass of something cold . The garden has its own super pool and spacious sun terrace in addition to the balcony. There is ample furniture for enjoying meals outside or just generally lounging by the pool.